For smartphones and tablets, in Spanish, English and French. 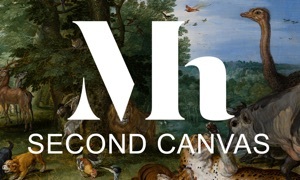 Second Canvas Thyssen is the perfect way to unlock the secrets of the Museo Thyssen-Bornemisza and use super-high resolution imagery to experience its splendid masterpieces like you've never seen them before. Explore, browse, learn and have fun with stories and secrets shared by the Thyssen's experts on any device: computer, tablet, smartphone, etc. You can even connect it to your TV screen at home or in the classroom. And you can share all of your experiences with friends on social media. Created by Museo Thyssen-Bornemisza and Madpixel with the exclusive sponsorship of Fundación BBVA, Second Canvas Thyssen lets you explore the museum's greatest artworks by choosing from a variety of themed itineraries. On this app, you'll find works by Caravaggio, Carpaccio, Vincent van Gogh, Kandinsky, George Grosz, Degas, Franz Marc, Cézanne, Dürer, Pissarro, Gaspar van Wittel, Antonello da Messina, Chagall, Murillo, Pollock, the Master of the Magdalen and many others in images of the best quality and resolution. • Discover incredible details and the stories behind them from museum experts: characters, symbolism, technique, the artist's style, etc.